It’s Suzuki’s new(ish) mid-sized naked bike or streetfighter. The engine is a reworked version of the GSX-R750 superbike’s straight-four cylinder, which has been tuned for more low- to mid-range torque. The frame, however, is entirely new. The GSR750 is good for anything except crossing continents or going off-road. The bike launches itself eagerly, dips into a brief (slight) low- to mid-range lull, catches up quickly and then chases the 11 000r/min redline like a greyhound. The engine feels smooth as silk and the slick, precise gear shifts and easy clutch make up- and down-shifts a joy. The progressive nature of the clutch prevents stalling the engine and makes it a good bike for novices. The GSR750 has an ultra-modern, chiselled, angular design reminiscent of the Transformers from the film(s) of the same name. It works well and makes you want to park it close by, so that you can constantly admire it – from its helmet-like headlight to its LED tail lights. The instruments are comprehensive. There’s a digital speedo, analogue rev counter, digital fuel and coolant temperature gauges, a gear-position indicator and it can also show average fuel consumption. There are two trip meters and a clock too. Mechanical equipment highlights are attractive: inverted forks for improved handling, 310mm dual front disc brakes, a 240mm rear disc brake and a triangular exhaust with butterfly valve for improved performance. Security is enhanced by an immobiliser with a chip in the ignition key, as well as parking lights. The bike is available in blue (it replaced the red of the 2011 model), black or white paint. The bike can potter around happily at lower revs, but if conditions and skill allow there’s substantial power to be unleashed higher up the rev range. Our average fuel consumption was an indicated 5.8 litres/100km and we certainly didn’t spare the rod. Suzuki says that the GSR750 is 10% more fuel efficient than the GSR600, even though it has a bigger engine and more go than the 600. We didn’t max it out, but Motorcycle News says that it will do 225km/h. Even though I’m tall and the bike is compact, it fits me like a glove. The suspension isn’t rock hard and is actually quite forgiving. “But the forks do excellent work when grabbing hard on the front brakes and the GSR keeps its nose up,” says our webmaster, Willem van der Berg. “It’s the kind of bike that makes you do silly things, like popping over a pavement or ramping over a speed bump. The suspension takes it all in its stride,” he adds. 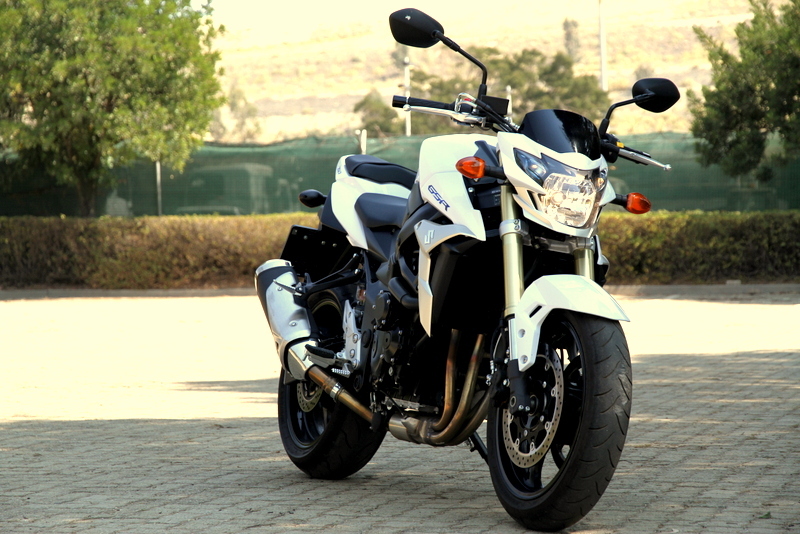 The bike feels light and agile at any speed and stable at high speed. The overall high quality of the bike and its sense of fun / I would like to have the added safety of ABS brakes and the price has jumped a bit since launch, because of the expensive yen.